It’s not unusual for Pepsi Japan to release unique flavors every so often. This past year we have tried Pepsi Baobab, Pepsi Shiso, and Pepsi Azuki. 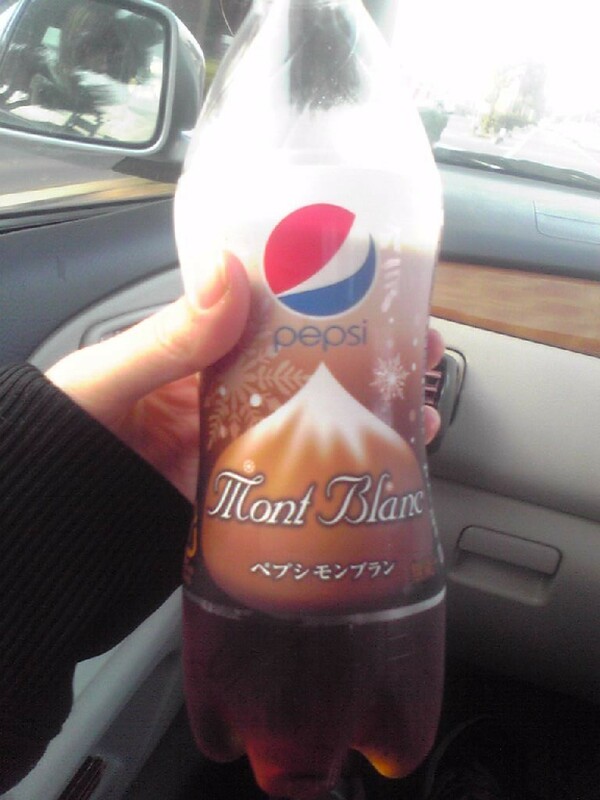 So when we saw Pepsi Mont Blanc in the supermarket, we knew we had to try it. And it was so strange. It said something like, “please enjoy this as a desert.” on the bottle’s label. But I think I would prefer to have a real desert, than to drink a cola. Heh. 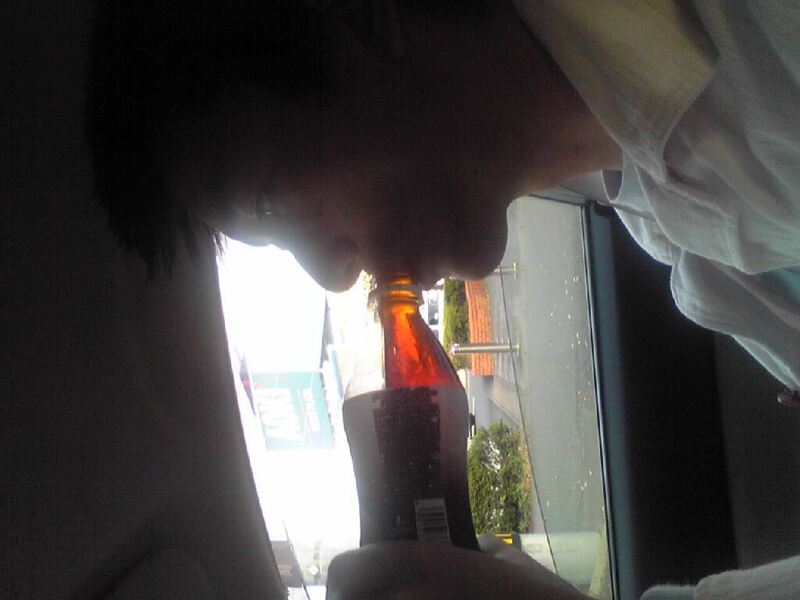 Then again, I’m not a fan of carbonated beverages anyway, so maybe that’s why. Don't mind the duck face. I feel like, for me, trying them once is good enough. Hehe. I guess I gotta think about making a youtube video soon. I have no ideas at all. Posted in Food, fukuoka, japanTagged Beverage, Bizarre, ciaela, Cola, food, japan, japanese, Limited Time, Mont Blanc, Pepsi, Pepsi Japan, ReviewBookmark the permalink. You should make a video about Japanese magazines! Use popteen or something with all the Photoshop and teenage plastic surgery tips. I think it’s interesting how many subculture magazines there are in japan. A video about your favourite Japanese food or drink, or about very weird japanese food and drinks. Do a video about how much you love Canada and why you would never leave Canada. Ever. Hmmmmm… what would I like to see? Maybe do something that a lot of Japanese people go crazy over that isn’t really a fad or anything here? Like… we love hockey (most people here do, and we’re known to love hockey, etc), but… what would be a Japanese equivalent that would be very weird to Canadians…? 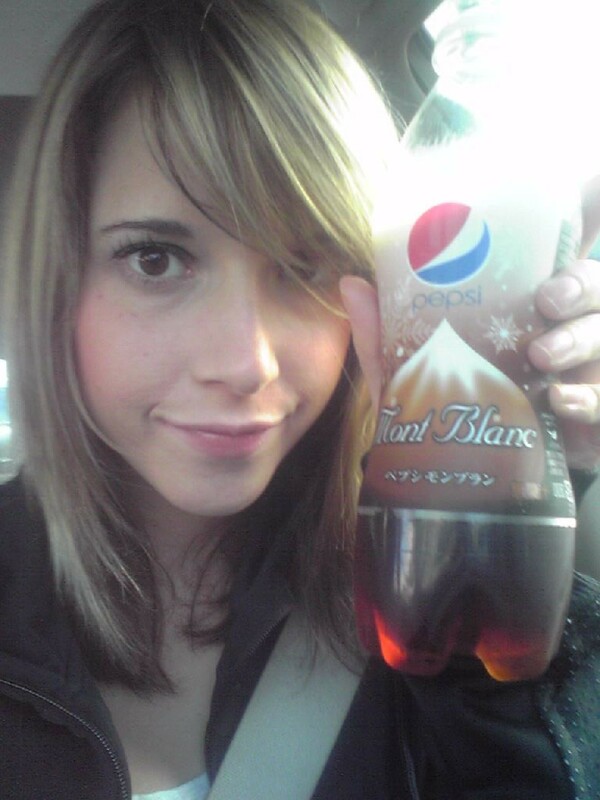 I like Pepsi…but I don’t think I could drink it as a dessert 0_o The Japanese come up with the strangest things, haha. But I always say that you should try anything at least once. “Don’t knock it ’til you’ve tried it!” haha. Was it better than the Pepsi Cucumber? I feel like you have shown a few videos about your music school and shown us your music, but have you told us what music you like? Tell us what kind of Japanese music/non-Japanese music you like. but how did the mont blanc flavour taste? Like sugar and caramel and carbonation and like… more sugar. i thought it tasted like coffee….and christmas lol. our bassist said it tasted just like mont blanc but i just dont see it. i tasted no chestnutty type taste at all. but it was delicious. i adored the shiso kind too but not the azuki.it:s sad when they go off the shelves. Can you please do a video on Sumo? Sumo is currently in Fukuoka. Also, can you provide us a detailed bio on the funny guy named Ryuhei who shows up once in a while on your videos? i watched your videos of youtube. i have to study hard!!! if i share your page, pleace do you be my friend? YES IT DID!! except i thought the marron flavor was very similar to christmas spice flavor….but it was very heavily coffee flavored to me. Do a video of you trying all the Pepsis and your reaction to them. I’m a Japanese girl and 16 yers old. I found your movie in Youtube when I serach “Canada”. Are you from Canada,aren’t you? What I will be able to go to Canada was decided on March. I will stay someone’s home. Also, if you haven’t already, you should make a video of what a day of work is like for you. Getting ready, how you get there, your building, what you do, eating lunch, going home etc. That would probably get a lot of views! Have you tried Pepsi Baobab? It was sold out when I was leaving Japan..